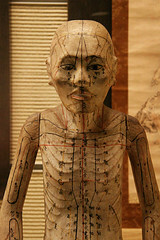 Japanese Acupuncture: Meridian Therapy — Amy Chitwood Burslem, LAc. My interpretation of and experience with Japanese acupuncture has been that it is relatively "painless" style of acupuncture, as the needle is usually inserted in a very superficial manner. The technique of meridian therapy is very light, and there are other wonderful Japanese modalities such as moxibustion (see the previous post on Moxibusion). Even though this particular style is does not feel the same as needling may in Traditional Chinese Medicine, the results are always effective (in my experience!). Meridian therapy treats the channel that is affected the most in the body. The pulse it taken on both wrists at the same time to determine a specific pattern. Once that pattern is found, needles are inserted at a shallow level to gently treat the affected meridian. There is a lot of palpation involved in this gentle therapy, and in Japan, we often hear of the blind acupuncturists. Read more about this amazing practice here. Due to the fact that I can't give this style of acupuncture much justice, read more about it on this website. Here in Portland, I recommend my instructor, Bob Quinn, DAOM. He has instructed several Japanese style classes, as well as a So Tai class for students (more on that wonderful treatment later! ).